The AluPen is a consistently good hard-wearing stylus. Comes in an array of funky colors and just works! The best stylus I have used right from the get go, from the craze to find the best pen to use on my devices, has to be The AluPen from Just Mobile. Yes it’s chunky, no it doesn’t have a super ultra thin point but it also doesn’t try and be so high tech that it fails all the time. It does what it does and does it well. 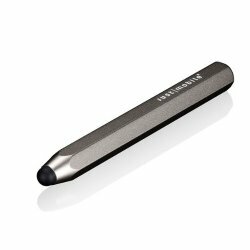 This would be my number one choice and recommendation for a solid, thick pen for quick doodles or even just to use to type, swipe or press things on my device – useful when you’ve just cleared all those fingerprints off your screen 😉 It has a rubberized tip and the length of the pen is just right. Some pens fall short and even though I have small hands this does not feel awkward or to large. Like everything it does take some getting used to but I have also managed to write with it so persevere with it and you may be surprised. It’s also affordable and looks pretty futuristic in a plain and simple kind of way. One of the applications I use to draw is Paper by 53 and I have some examples of the work I have made with some of the styluses mentioned here so if you haven’t had chance to catch my Drawings and Doodles on Tumblr post take a look at what the stylus pen can do. 53 also offer their own stylus called Pencil and even though I use their app quite a bit I haven’t made the leap to add their particular stylus to my collection. 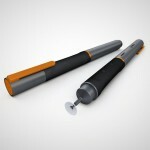 It’s an interesting looking stylus which is compatible with the Paper app. You can connect it to your device via Bluetooth and boasts several features including Surface Pressure, Erasing, Blending and adaptive Palm Rejection. It’s rechargeable in 90 mins via USB and claims to last for up to a month on one charge. These features are only compatible with the the Paper app (at this point in time) so it’s good to remember that you will not benefit from these features in other applications – it will just work like a normal stylus. Unlike other styluses it’s made from sustainable wood so it is very unique in that respect. As promised, lets return to HEX3 and find out what they have been working on since pretty much discarding the JaJa Pressure Sensitive stylus. First up they have one stylus called the YuFu. It comes in three versions Pro (for serious artists and perfectionists), Focus (for advanced note-taking and sketching) and Note (for notes and sketching on all tablets). Splitting out one pen into three different categories is very confusing to me. I want a pen with interchangeable tips so I choose whether I want to sketch or take notes I don’t want to be confused by what seems to be the same product with minor differences. Looking at the description, it seems a safe bet to choose the Focus as it has advanced note-taking capabilities as well as allowing you to sketch comfortably but it’s an expensive mistake if you find you actually needed the Note as that implies it’s compatible on all tablets. Does that further imply that the other two are not going to work with all tablets? 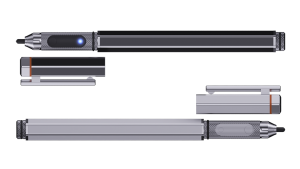 A bit of a gray area and whilst it’s great to have choice, I would prefer one pen with interchangeable options so I can choose how I use my pen depending on what I am doing. Instead, they have three pens which each have interchangeable tips – I think most people, like myself, will find this super confusing! The pens are not quite available at time of writing, but you can pre-order already for delivery early 2015 . If you are interested in finding out more check out the HEX3 website for more information.